Witness the story behind C-3PO's new arm from James Robinson and Tony Harris leading into 'Star Wars: The Force Awakens'! This December, experience a very special one-shot: an exciting new chapter in the Star Wars saga! Today, Marvel is pleased to announce STAR WARS SPECIAL: C-3P0 #1, launching as part of Journey to Star Wars: The Force Awakens! Reuniting acclaimed and award-winning creators James Robinson and Tony Harris for the first time in nearly two decades, follow everyone’s favorite protocol droid on a solo adventure leading up to his appearance in Star Wars: The Force Awakens! Plus, the burning question will be answered here: How did C-3P0 get that red arm?! 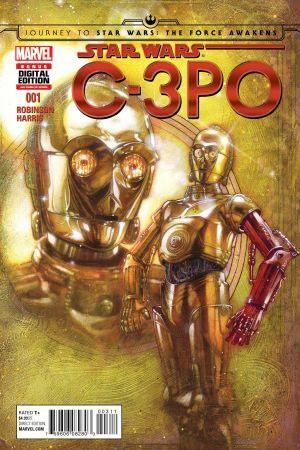 STAR WARS SPECIAL: C-3PO #1 is the only place to learn the shocking truth behind how C-3PO lost his original arm – and the exciting origins of how he gained a new one! You may be fluent in over six million forms of communication…but this book is a must have in any language! Don’t miss the exciting origin of C-3PO’s crimson appendage this December, only in STAR WARS SPECIAL: C-3PO #1!